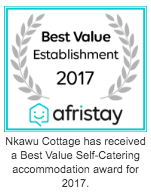 Nkawu Cottage offers you quality self catering accommodation, in the friendly, idyllic setting of Mtunzini, KwaZulu-Natal. Situated just 135km from Durban on the North coast of KwaZulu-Natal, our comfortable self catering cottage has everything you need for an amazing getaway, whether with you are travelling with family, on a couples retreat or traveling for business. Mtunzini has a number of shops and restaurants in town for your basic culinary needs, and many other exciting activities for you and your family to enjoy, including; its own nature reserve, magnificent lagoon, breathtaking dunes and endless, clean beaches which are only 2.3km from the Nkawu Cottage. Find out more! Visit hotel-base.com The largest online accommodation directory listing accommodations with links to their websites. More than 60,000 hotels, bed & breakfast, guest houses, hostels and self-catering in over 200 countries.